That we know of, various Arctic explorers have grazed the edge of the Northern polar opening to the hollow portion of the Earth and come back to give deductive evidence of its whereabouts and existence. We will attempt to expand upon this idea and establish a general perimeter around the polar opening. The above map illustrates our hypothesis that the Arctic orifice begins at some point North between the New Siberian Islands and Zemlya, and stretches across towards the Elizabeth Islands in Canada. We can begin our ring around the opening at the North Pole. It suffices to say that the pole has been visited umpteen times and that no polar orifice is apparent right at that point. It is close, though. Photographs of the Pole show foreshortening of the horizon such that the horizon drops off sharply; the landscape doesn't extend as far off as it does in lower latitudes. Also, polar anomalies, such as warming, the presence of warm-blooded animals, and Northward migrating birds, have been documented from there. What interests us about the expedition carried out by Doctor Fridtjof Nansen and the crew of the Norwegian ship Fram, between 1893 and 1896, is the fact that Nansen's course across the polar ice was erratic and hinted of close proximity to the opening. In fact, if one looks at the charts provided in Nansen’s book Farthest North, one will see some very exagerated zig zagging in March and April of 1894, right around 80* North latitude and 135* East longitude. Earlier in November of 1893 Dr. Nansen and the crew had to adjust their latitude calculations by almost one whole degree within a ten-day period. It is improbable that they moved so much in so little time; the current moving the ice upon which they were perched was only moving a couple miles per day, maybe three. They chalked up the aberrations to navigational errors, which attests to their honesty. But could it be so? They were not amateurs. Their navigator was Sigurd Scott-Hansen, an academy graduate and career officer in the Norwegian Navy. But they were all master seamen- that's why they were chosen for the trip. They all knew the science of navigation. What about curvature? What if the curvature of the Earth was flattening out and this is why the Norwegians couldn’t pinpoint their location. Everyone knows that the Earth is not an exact sphere; it bulges slightly at the equator and flattens at the poles ( it actually angles inwards ). Hollow Earth proponents would say that there was sure a lot of flattening going on, and that a mere tendency for the curvature to plane would not account for the type of exagerrated movement, in terms of latitude, that the Norwegians experienced. What could actually account for what seemed to be so much sliding around, however, would be if the curvature had not only flattened out, but had begun a downward decline into the doughnut-shaped opening of the inner Earth. Such angles could easily account for the impression of exagerrated movements as they crossed and re-crossed, even staggered along, the rim of the opening. If we imagine the face of a clock superimposed upon the opening, this grazing would have ocurred at around five o’clock, with six o’clock being at Zemlya on the Russian side, the Pole at about nine or ten o'clock, the Elizabeth Islands at twelve o’clock and the Bering Straits at two o’clock. Do the navigational anomalies prove, by themselves, the existence of a polar opening? No, and taken piecemeal, most of the polar anomalies can be explained in other ways. For example, the volcanic ash which is so typical in the polar areas could be due to an uncharted land mass and not an opening- maybe the governments of the region have reason to hide such a land mass from the public, maybe for security reasons. But taken all together, polar anomalies, including curvature anomalies, constitute strong deductive evidence. We can close our ring around the polar opening by considering the dirgible flight of Roald Amudsen in May of 1926. Amudsen passed over the pole, then steered a course along 170* longitude West towards the Bering Straits between Alaska and Siberia. He experienced a couple of the usual polar anomalies the farther North he went: Warming of the air and sea temperatures was one of them, and the presence of land birds too far away from any land. What is most interesting to our current analysis is the fact that when the Amudsen dirgible reached the Bering Straits it ended up over 100 miles off course on the Russian side. This suggests that the dirgible dipped into and followed along the bowl-like depression of the opening, and that the irregular curvature threw it off course and sent it into Siberia on a slight tangent. All of the above evidence suggests a polar opening, on the Siberian side of the Pole, within a ring established by the different polar explorers. The Amudsen dirgible flew over extended stretches of cloud cover, which leaves open the possibility of its having been rather far down the funnel of the opening, maybe even rather close to the neck of it, without the occupants realizing it. The warmer air of the interior mixes with the colder air of the Arctic and produces fog and clouds. This means that the opening could stretch from the area where Nansen and the crew of the Fram experienced their polar anomalies, which was on the Siberian side, quite a ways across the Polar basin towards the Canadian side. This was actually inadvertently indicated by the Russian description of the magnetic pole as a line stretching 1,000 miles from above Zemlya and across the Arctic towards Elizabeth Island. All of our evidence is circumstantial so far. In order to reinforce our argument, let us now consider actual sightings of land masses within our ring-like framework. We shall draw upon Admiral MacMillan’s book Four Years in the White North. The following testimony is not the testimony of the admiral himself; rather, it is testimony of others which he compiled in an appendix to his book. 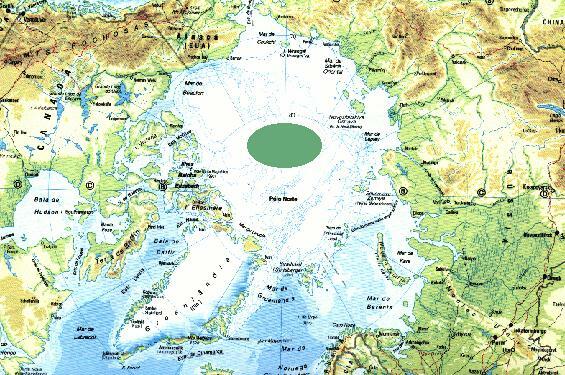 ” In 1850, Captain Mc Lure, when off the Northern coast of Alaska, wrote in his journal that judging from the character of the ice and a light, shady tint in the sky, there must be land to the North of him. ” The only report of land having been seen in this vicinity by civilized man was made by Capt. John Keenan, of Troy, New York, in the Seventies ( 1870s ), at that time in command of the whaling-bark Stamboul, of New Bedford. Captain Keenan said that after taking several whales the weather became thick, and he stood to the North under easy sail and was busily engaged in trying out and stowing down the oil taken. When the fog cleared off, land was distinctly seen to the North bv him and all the men of his crew, but as he was not on a voyage of discovery, and there were no whales in sight, he was obliged to give the order to keep away to the South in search of them. But this varied collection of testimony is just the tip of the iceberg when compared with the testimony of men such as Doctor Frederick A Cook, arguably the true discoverer of the North Pole, Admiral Peary, and the actual testimony of Admiral MacMillan himself. The observations of these men have been laid out and explained very well by others, but we will present the essence for the benefit of the reader's understanding. These three were all active around the Northern tip of Ellesmere Island, which is also the Northernmost tip of Canada, and which lies right next to the tip of Greenland. The area is only about 6* from the Pole. From various points of elevation, as well as from across the ice, as much as ten years apart, these three men observed a mountainous land mass which they described as filling up a third of the horizon, about 120* around them. Admiral Peary mentioned distict white summits on June 28th, 1906. Admiral Macmillan organized an expedition which traveled across the ice 130 miles after seeing this continent from the heights of Ellesmere Island and wrote that his observations resembled in every particular an immense land while observing in clear weather with powerful binoculars. He went on to describe hills, valleys and snow-capped peaks, all this in April of 1914. Which brings us to the testimony of Dr. Frederick A Cook. Dr. Cook also observed this land mass while traveling across the ice. He made a round trip to the Pole and choose a much more Western route, bringing him closer to the sighting. Dr. Cook also made entries in his log book just as the other explorers did. Additionally, however, he took some photographs. The significance of this is that, first of all, we have some visual evidence to consider, and that second, we actually have a picture of a land mass which is not exactly on the surface of the Earth, but rather, which fingers its way up to near the rim, from within. It is amazing that evidence such as this could exist. The photographic plates formed a part of the Cook collection in the U.S. Library of Congress, but by an ironic coincidence, they are missing. Even so, one single picture remains with us because it is in the book by Doctor Cook. It was scanned with good resolution by Jan Lamprecht and included in his book Hollow Planets as Plate 31. The points to be made with reference to the picture are that it cannot be confused with sea ice on the horizon, nor with ice islands that typically have ice mounds atop them, ( such do exist ). It is a picture of a land mass, confirmed by Eskimo testimony, and answers to some specific descriptions in the doctor's log book. The sighting seems to have been a mirage, but this is not to say that it was false. A mirage is actually a reflection which is carried over long distances through thermal layers of air. If the mirage were to originate from a curved, funnel-like opening, this would facilitate its long-distance projection. Therefore, it seems reasonable to hypothesize that the observations made by Cook, Peary and MacMillan could have had their origin as much as a few hundred miles away, which would put it within the area which we have circled in our ring around the opening. Mirage behavior would also explain the previously mentioned sightings from the Northern rim of Alaska and Canada, that they were seen over a distance, although the land was not adjacent to the North American continent. Nansen also experienced a mirage, apparently of the inner sun, from the Russian side, just above the New Siberian Islands. There are a few hints in his description which suggest that Nansen viewed a mirage of the inner sun. The North Pole attainments of both Dr. Cook and Admiral Peary reinforce the idea that the opening is not far from the Pole, i.e., five degrees or so and inside of our " ring." By “ attainments,” we are referring to the fact that both Cook and Peary claimed to have arrived at the North Pole. There is a controversy surrounding this matter, but for our purposes it is enough to say that both passed at least close to it. Now, what did they experience? On their way, they had to penetrate ( from the Canadian side ) over a ridge of crumpled-up ice which runs in a circle around the opening. Once they crossed that ridge of ice, they found relatively smooth ice over which they made quick progress- too quick, in fact. Some of Peary's speed, for example, can be attributed to the smoother ice in the area around the Pole, but not all of his speed- he claims to have covered 153 statute miles in just over two days, as he began his return. Smooth ice might have helped his speed, but not that much. The only way that we can account for his speed is if we take into consideration the flattening of the curvature of the Earth in the region of the opening. The flattening of the curvature gives a false impression of the Northward distance covered. A lingering doubt in the mind of any thoughtful person has to do with the lack of direct discovery and perception. There are reasons for this. We’ll leave any conspiracy theories aside for the moment, and will consider the possibility of explorers passing close by the opening without perceiving it. How could this be so? Commercial aircraft have typically taken routes around the area in question, but not through it. Very recently, passenger flights began flying across the pole, a bit towards the Greenland side. At times, some flights have been deviated to a route further away. But why don't modern aircraft fly to the edge of the opening? This is because there is all kinds of magnetic distortion near the opening because the magnetic lines of force pass through the inner rim of the doughnut opening. So as aircraft approach the opening, their instruments of navegation typically go haywire. At this point, it is assumed that the aircraft is basically over the pole. With the navegational instruments haywire, how is anyone going to know exactly where they are? And why would any pilot stick around to find out? The standard maneuver, as a pilot passes near the magnetic distortion, is to execute a right-angle turn until the navegational instruments re-orient themselves, then head back in his original direction. As many times as the pilot experiences magnetic distortion, he executes right-angle turns until he works his way around the circular opening, which defines the distortion in the first place, then procedes in his original direction. In this way, even given hundreds of opportunities, aircraft only approach the rim without penetrating inwards any further. But what about Artic explorers? The Pole has been approached from various angles, even from converging angles at the same time, the expeditions joining up at the Pole. How come no opening has been noticed? This is because the funnel shape of the opening would give the illusion, to a person travelling across along the bowel-like side, of having come straight across the neck of the opening. Such a traveler would have experienced exaggerated sledding speeds as the curvature flattened out and angled inwards, and any movement would have given greater Northward progress across the top of the world. Along the inner rim the angle of the curvature would have tilted inwards. Thus, looking straight above, the person would seem to be looking at that point which is straight over the middle of the doughnut opening, but from an angle, off to the side, and without realizing that any inward angle is even involved! Thus, the person would have crossed, roundabout, to one side of the opening while thinking that he/she had made progress straight across. Arriving at the other side, the person might have remarked " Well, I didn't see any polar opening and I just came straight across the area." True, this traveler would not have seen any opening because the opening does not have a right-angle drop, and the opening is too huge to notice any dimensions. The only thing that the " traveler " would have seen would have been the horizon, because the curvature is gradual. But a change in the horizon would be noticed because the horizon is foreshortened due to the fact that the curvature does become more acute as it angles inwards. This was noted by Lt. ( later General ) Greely, as well as Admiral Peary, North of Greenland and Canada, what to speak of Dr. Fridtjof Nansen on the other side of the basin. One can only stop and wonder if it really isn't possible after all for there to be a hollow portion to the Earth on which we live, with openings at the polar extremes.